Every class at the Center for Yoga has students with diverse levels of experience. You are welcome as you are. brand new to yoga or with years of practice behind you! Each experience will be new and there will always be someone you can follow (ask the teacher to direct you to a spot where a seasoned practitioner lies!) Although all of our classes can be physically challenging, students will find the yoga room to be a truly non-judgmental environment. The breath is the primary focus throughout the practice. Developed by Jonny Kest as an evolution of Ashtanga Yoga. Vinyasa means to link breath with movement and FLOW! 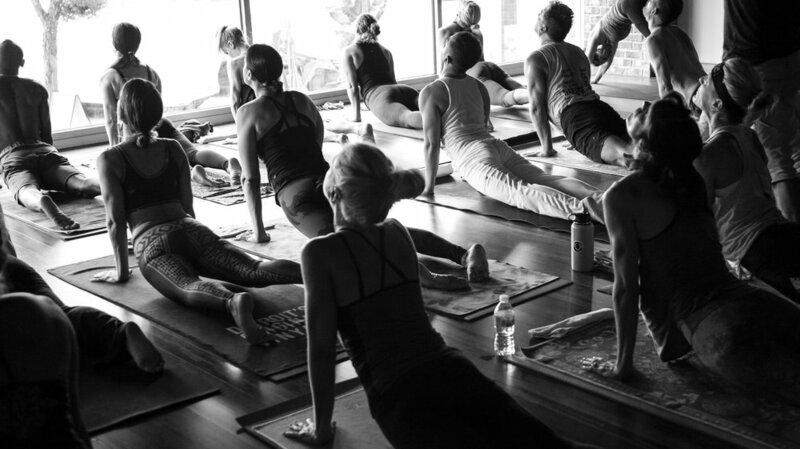 This heated, breath centered class will exceed your expectations. Bring a towel and be prepared to follow along for the first few classes. Your teachers will support you and your community will lift you up! Leave after one hour feeling much lighter than when you walked into the room! Physically intense & emotionally liberating! In the early 90’s Jonny developed Healthy Backs ™️ Yoga as a means to help relieve the back pain epidemic sweeping the western world. This practice worked to integrate a deep inward focus ( eyes closed ) and upheld an architecture that proved to move prana ( energy ) to the spine and it’s surrounding organs. Today, the practice is called Slowburn ™️ Yoga. Simple Flows and longer holding postures make it an excellent starting point if you are new to yoga! This totally integrative practice is breath centered and held in a warm room. Yin Yoga is primarily all seated postures. Each pose is held for 3-8 minutes to allow a deep massage and unraveling of the connective tissues. Highly therapeutic + promotes deeper sleep! 5:25 am Ashtanga Primary & Secondary Series Practice. The teacher will lead you through their morning asana beginning with Patanjali's Invocation. All postures will be called in Sanskrit. An energizing way to begin your day! Kids Yoga class is held on Saturdays @ 2:45 pm. All ages are welcome as long as the child is able to stay in the room on their own! Parents are free to wait in the lobby or drop their child off and come back for a 3:45 pm release! See our online schedule to purchase class packages. Walk-Ins are welcome. Parents may choose to practice in our 2:45 pm Hot Vinyasa class in the next room! We offer childcare services for selected classes 7 days per week! Please see our live schedule to pre-register online! please do not hesitate to contact us by emailing feedback@centerforyoga.com if you have any questions about our class styles before you begin your journey! We are excited to share yoga as a healing modality! see you soon. Please bring a yoga mat, towel and water bottle to each practice. Rental yoga mats are available for $3 at the reception desk.